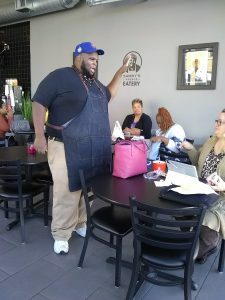 Sammy McDowell has been in the food business for most of his adult life, and he’s owned and operated Sammy’s Avenue Eatery at West Broadway Avenue and Emerson Avenue North since 2012. The Eatery is newly remodeled and reopened, and McDowell is hoping for a brisk business and profitable future. But he also wants more from the restaurant. He wants a place where North Side neighbors can gather – to meet and eat, sit and talk, rest and enjoy life. He wants to make a contribution to the fabric of the neighborhood, and that’s what endears him to the Sisters of the Visitation. McDowell grew up in South Minneapolis but went to North High and graduated from Henry. 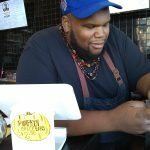 He attended MCTC and then found his first job in the food business: eight years at Kentucky Fried Chicken, five more at Subway. He learned how to run a business, and he knows how to put out good food. Just ask Will Wallace, who runs the North Four program for young men at Emerge; Wallace is in the business of turning kids from the street life to the good life, complete with training and a steady job. On a lot of days, he starts his morning at the Eatery with a breakfast sandwich. Sammy recalls meeting some of the Sisters shortly after the Broadway eatery opened. He says they held a few meetings at the restaurant and later gave gift certificates to some neighbors who came to their door with an empty stomach, in need of a good meal. “I love the fact these women came over to introduce themselves,” he says. “The Sisters bring stability to the neighborhood. They are consistent in what they do. They are honest, and they are genuine. They’re a bridge between black and white. McDowell says he’s thinking of keeping the Eatery open a little later at night to accommodate a few local musical groups, so folks could sit back and listen to some blues. The blues, breakfast, and brotherhood: they’re a good combination anywhere, and Sammy is trying to dial it up in North Minneapolis. The Sisters are not surprised: it’s in his nature.